is a measure of how willing the estate is to aid in the nation's government. It is a modifier that decays slowly towards its base value of 50. The speed of decay depends on how further from 50 it is (further = faster) and on any other loyalty decay speed modifiers present at the time. Loyalty scales from 0 to 100, and is separated into three tiers: disloyal (0−39), neutral (40−59), and loyal (60−100). Loyalty determines what effects the estate confers, both on the provincial and national level. When disloyal, an estate confers only penalties; when neutral, it confers a single bonus; and when loyal it confers an additional bonus. The strength of the effects is determined by the estate's influence. Loyalty is affected by estate interactions, various national factors, events, decisions, provincial development and territorial grants and revocations. is a measure of how much power the estate has over the nation's government and scales from 0 to 100. Influence determines the strength of the national effects conferred by the estate's loyalty through four levels: 0−19 / 20−39 / 40−59 / 60−100. These levels modify the effects by a factor of 0.25 / 0.50 / 0.75 / 1. The provincial effects are not affected by influence and are applied in all provinces owned by the estate. Moreover, if an estate's influence is 100, regardless of the estate's loyalty, the nation is at risk of the estate seizing power in a coup, in the form of a disaster. Influence affects also the strength as well as the possibility of some estate interactions. Each estate has a base level of influence, and is affected by estate interactions, various national factors, events, decisions, and territorial grants and revocations. Influence does not increase or decrease over time. Revoking province is the only player-controlled way to decrease influence. If an estate's influence drops to 0, it will grant no nationwide effects but will still appear in the Estates interface and still affect controlled provinces. can be granted to an estate to increase its loyalty and influence. 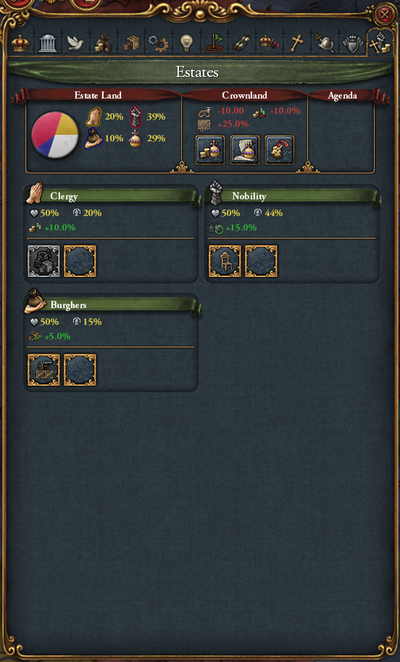 A province can be granted or revoked in the Buildings tab of that province. Granting a province to an estate sets a minimum local autonomy floor to the province and confers various provincial effects based on the estate and its level of loyalty. Once granted to an estate, a province cannot be revoked until one year has passed. If an estate is disloyal, revoking a province from the estate will cause rebels to rise up. Developing an estate province is treated as if they were granted additional development; losing an estate province (peace, sale etc.) will cause their loyalty to decrease (amount dependent on province development). Revoking an estate from a province will add 25% local autonomy and a temporary +5 unrest modifier unless the province is granted to another estate. The capital cannot be granted to an estate and a province cannot have both an estate and a parliament seat. Trade idea groups and the nation has at least 10 provinces. capital in one of the Swahili Coast areas: Central Swahili Coast, Northern Swahili Coast, Mogadishu, Mombasa and Mozambique. Particularist rebels will rise in revolt in that province. 100 influence, their estate disaster will begin ticking and - unless lowered - will eventually trigger the Plutocratic Coup disaster. Religious idea group and the nation has at least 10 provinces. Zealot rebels of the state religion will rise in revolt in that province. 100 influence, their estate disaster will begin ticking and - unless lowered - will eventually trigger the Dominance of the Clergy disaster. Influence idea groups and the nation has at least 10 provinces. Noble rebels will rise in revolt in that province. 100 influence, their estate disaster will begin ticking and - unless lowered - will eventually trigger the Aristocratic Coup disaster. influence apply to the estate which provided the interaction. Influence and modifiers gained from interactions will remain active for said interaction's cooldown period. 3 influence per 1% of total development). The AI will always grant provinces to the estate as long as it doesn't push its influence too high. If the estate revolts it will form a new nation consisting of the provinces previously given to it. Cossack rebels will rise in revolt in that province. 100 influence, their estate disaster will begin ticking and - unless lowered - will eventually trigger the Cossack Independence disaster. Humanist ideas group and the nation has at least 10 provinces; The AI will continue doing so as long as it doesn't push its influence too high. Zealot rebels of the province's religion will rise in revolt in that province. 100 influence, their estate disaster will begin ticking and - unless lowered - will eventually trigger the Dhimmi Independence disaster. 0.6 influence per 1% of total development). Tribal rebels will rise in revolt in that province. 100 influence, their estate disaster will begin ticking and - unless lowered - will eventually trigger the Dominance of the Tribes disaster. Hindu Zealot rebels will rise in revolt in that province. 100 influence, their estate disaster will begin ticking and - unless lowered - will eventually trigger the Dominance of the Brahmins disaster. Burghers estate. The AI will keep granting provinces to Jains as long as it doesn't raise their influence too high. 100 influence, their estate disaster will begin ticking and - unless lowered - will eventually trigger the Powerful Jain Society disaster. Nobles Estate. The AI will give this estate provinces as long as it doesn't raise influence too high. 100 influence, their estate disaster will begin ticking and - unless lowered - will eventually trigger the Maratha Independence disaster. 100 influence, their estate disaster will begin ticking and - unless lowered - will eventually trigger the Rajput Independence disaster. 100 influence, their estate disaster will begin ticking and - unless lowered - will eventually trigger the Vaishya Guild Coup disaster. marketplace in a burgher province. influence above 50, but be wary of getting above 75 as an unexpected event could launch an estate disaster. influence from events or interactions will expire soon, dropping their influence back below 100, before revoking provinces.